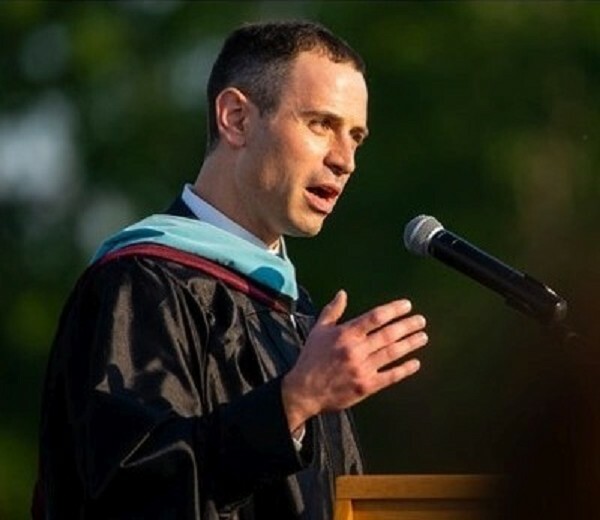 When Jon Paul Morosi spoke at the Garber High graduation May 31, it was the culmination of a dream for fame in sports. It also was a life lesson for the 123 Garber graduates who received their diplomas that night at Ed Harvey Field: You may not achieve your ideal career, so be prepared to shift gears on life's pathway. That's what happened to Morosi. The fame has come not in the gladiatorial combat on the gridiron, as he had dreamed of as quarterback for the football Dukes. As it turned out, Morosi, now 36, parlayed a writing career on the Harvard Crimson to the top levels as a sportswriter for the Seattle Post Intelligencer and Detroit Free Press, and a TV anchor and analyst with Fox Sports, FS1, the major league Baseball Network. Instead of being out on the field directing a team of elite athletes as he had envisioned while in high school, he is a Harvard graduate in the broadcast booth where his face and work is familiar to millions of fans. "Hours before, he had played the game of his life. Of the 25 passes he threw, 20 were caught. Two were dropped. Two hundred fifty yards. One touchdown. Everything he hoped for in his last home game." He limps to his parents' car after the game, thinking. At midnight he limps back to the field and sits beneath the goalposts. "He wonders about football, about college, about his girlfriend, about his future -- stuff 17-year-old boys think about on rare occasions they allow themselves to." He hopes to continue playing football. Michigan? Northwestern maybe? Division III his Dad favors? "His guidance counselor says he has a chance to get into an Ivy League school. He really doesn't know what he wants. He's 17." "A couple of months later a big package arrives from Cambridge, Mass. Today, four years later, he graduates from Harvard, one of the world's most prestigious universities. "Somewhere in between, the kid realized he was 5-8 and slow. He never did play college football. So much for The Plan." "It's 2004. It's midnight for the kid now. He is graduating from college. "He's not on the team anymore. He's not the one throwing passes, scoring goals or taking the outside deuce to right. "No need to beckon anymore. He's going to the press box on his own." "Never again will he cover a game for his student newspaper. He surely won't play another game of football. The press box beckons. He wears a suit now. This is a job, one he loves. He hopes to make it a career. That he has done, with great success.